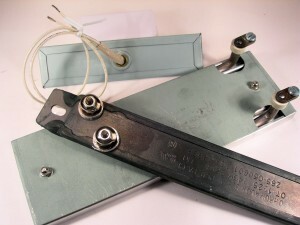 Jobco Supply sells strip heaters manufactured by Watlow, Chromalox, Tempco, & Backer Marathon. Ceramic insulated and mica insulated strip heaters are used for convection air heating or clamp on thermal conduction heating. The ceramic insulated strip heaters are available in a wide variety of stock widths and lengths. Depending on the manufacturer, some ceramic strip heaters can obtain temperatures up to 1500°F (815°C). The mica insulated strip heaters can be custom-made to the meet your size requirements. These heaters are more suitable for applications that will not require the outer sheath temperature to exceed 850 to 900°F. Strip heaters are generally known as standard quality heaters that are mainly used for convection-type air heating and clamp-on installations. When selecting for strip heaters you need to consider the applications of the heater. Watlow’s strip heaters are a versatile and flexible solution for a number of applications. These heaters can be bolted or clamped to a solid surface for freeze and moisture protection. The strip heaters make use of the most advanced heat construction techniques. Call Jobco Inc. today to order your stock or custom strip heater at 479-424-1300. Strip heaters are sometimes referred to as bar heaters or duct heaters. These heaters are known for providing a versatile solution for a number of electrical heater applications. They can be bolted or clamped to a solid surface for freeze protection, moisture protection, food warming, heat treating, heat sealing, glue pots, hot plates, and many other applications. Call JobcoSupply.com today to get your strip heaters at 479-424-1300.